Joseph Parker’s stablemate Umar Salamov produced an impressive fourth round TKO to book himself a likely spot on the undercard of Manny Pacquiao and Jeff Horn’s title fight in Brisbane. Russia’s 1.93m Salamov was in total control from the outset against Bosnia’s Emil Markic, handing him just his second defeat of a 25 fight career. 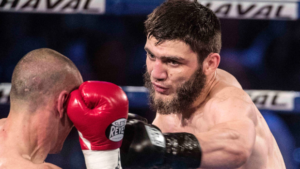 Salamov improved to 19-0 – and claimed the vacant WBO international light heavyweight title previously held by American champion Andre Ward, along with the and vacant IBF east/west Europe titles in his first fight in New Zealand. The 22-year-old showcased variety – working the body, changing angles – as well as landing fast combinations and a deadly overhand right. He handed Markic a standing count in the fourth round, and then finished him off with 45 seconds left in the round. Salamov is now expected to get a spot on the Pacquiao-Horn undercard on July 2.